Sometimes cooking accidents are serendipitous. Often, a cooking mistake or attempted recipe "improvement" turns whatever it is you're making into a flop, but sometimes - just sometimes - it turns out for the better. 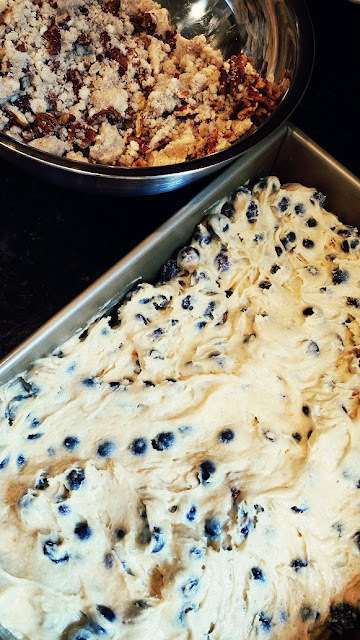 Following along my blueberry theme, I spied a wonderful blueberry coffee cake recipe from one of the great, baking Godmother's herself - Dorie Greenspan. 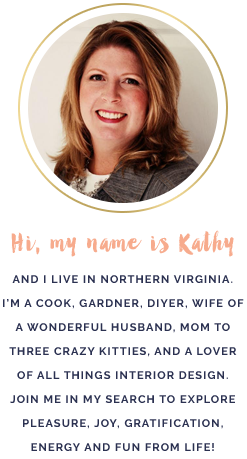 I'm sad to say that I haven't given her book, "Baking: From My Home to Yours" enough attention, even though I've had it for several years. 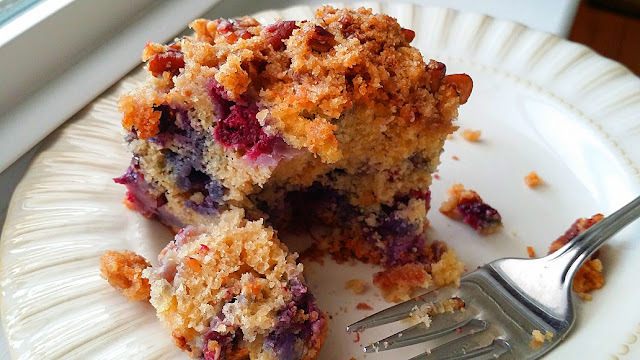 Her Blueberry Crumb Cake was on my radar and I had all of the ingredients except walnuts...at least I thought. "Well, I have pecans, so I'll just use those." I said. And then, I noticed I didn't have a lemon for the called-for lemon zest. "I guess orange zest will have to do because that's what I got!" And finally, when mixing everything up, I accidentally added 1/2 stick more butter than what was called for in the recipe. I was doubling the recipe and accidentally beat in 2 whole sticks of butter instead of 1 1/2 sticks. "Well, if it's meant to be, it's meant to be. Let's see what happens anyway." So, into the oven it went. To my surprise, what came out was an oh-so-tender cake, with a wonderful hint of orange, and nubby-crunchy in all the right places. Sometimes accidents are meant to happen, and this is an "accident" that I will happily make again. To make the topping: Put all the ingredients except the nuts into a food processor and pulse just until the mixture forms clumps. Scrape topping into a bowl and and stir in the nuts. Refrigerate until needed. To make the cake: Using your fingers, toss the blueberries and 2 tsps of flour together, just to coat the berries; set aside. In a separate bowl, rub together the sugar and the orange zest with your fingers until the sugar is moist and aromatic; set aside. Mix the 2 cups of flour, baking powder, baking soda, salt, cinnamon and nutmeg together in a separate bowl; set aside. Using a stand mixer, beat the butter and orange-sugar mixture together until light and fluffy. Add the eggs one at a time, beating in between each egg, then beat in the vanilla extract. Don't be concerned if the mixture looks curdled - it will smooth out. Add the flour mixture and buttermilk alternately, beginning and ending with the flour. Don't overbeat. Gently fold the blueberries into the batter. Scrape the batter into an 8-inch buttered pan and smooth until level. Pull the crumb mixture out of the refrigerator and crumble it on top of the batter. Lightly press the crumb mixture into the batter. Bake for 55-65 minutes, or until the crumbs are golden and a thin knife inserted into the center of the cake comes out clean. Transfer the cake to a rack and cool just until it is warm or until it reaches room temperature. Fishinghunter, sure be my guest. Happy baking!